The decorative lights wrapped around the stage twinkling in the dimly lit conference room at the Marriott West in Madison, WI. The hum of conversation from more than 200 contractors based in the Madison area filled the air. They were taking an evening out of their busy lives to share a meal and recognize exceptional remodeling work. 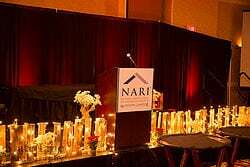 Even though the winners of each category of the 2014 NARI Contractor of the Year and Achievement Awards were already public knowledge, the room was still thick with anticipation as each company waited to be called to the stage to receive its award. As the ceremony got underway and company after company was recognized, a common theme began to emerge. One speaker after another mentioned the pleasure of working with sub-contractors and fellow employees who held to high standards of business ethics. While the before and after pictures of remodeled bathrooms, bedrooms and kitchens were beautiful and impressive, the focal point of the night was on a much less physically tangible achievement. In an age of fluctuating economic health and ever-growing desire for success and profits, these companies had maintained their commitment to working ethically; to uphold what Cambridge Dictionaries Online defines as the rules, principles and standards for deciding what is morally right or wrong when doing business. Paul Ganshert, repeatedly commented that this chapter stands out. Visiting a national NARI conference and mentioning the Madison Chapter, causes eyes to light up and questions to pour out. Other chapters want to know what Madison is doing to have such a strong and successful presence in the community. While the incredible NARI staff and Board of Directors deserve credit for pushing the boundaries and thinking outside the box, an association can only be as strong as its members. It is clear that the ethical principles guiding NARI members are what make the Madison Chapter such an incredible group of professionals. At A&J Specialty Services, Inc. DKI our response to the NARI Contractor of the Year Awards Banquet is to say thank you. Thank you to all the NARI members who adhere to a high standard of ethics, morality, and honesty in the industry. In a world consumed with getting ahead and looking out for number one, hard-working, honest people like the Madison Area NARI contractors are what keep our region and this nation a leader in the business and service world. And while we only take one night a year to celebrate all the NARI members who work so hard and excel in their industry, we want you to know we thank and applaud you every day.